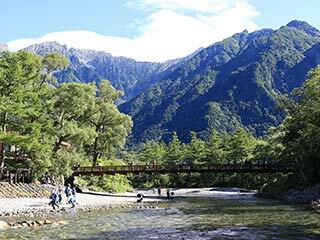 Kamikochi Highland (上高地) is one of the most popular tourist spots and nature spots in Japan. It is located in Matsumoto, Nagano Prefecture. It is considered as one of the best scenic beauty spots in Japan and registered as Special National Scenic Beauty and Special Natural Monument of Japan. There are many hiking trails and very easy to walk because it is very flat trail. You can enjoy great forest, pure water and ponds and breathtaking views of surrounding Mountains. From Kappabashi Bridge, you can have a great view of Hodaka Mountains. You cannot access by your car. There are many hotels, restaurants and gift shops. 1. use Alpiko Line Kamikochi Line to Shinshimashima Station. 2. Shuttle bus to Bus Terminal. Kamikochi is the highland located on Hida mountains and Kita-Alps of Nagano Prefecture. The altitude of the highland is 1500m above the sea level. Therefore, it is very cool even in summer. Even though Kamikochi is the highland, the entire site is very flat which is very rare in Japan. Therefore, the hiking trails are very easy to walk. It has the best view of Japanese nature, especially the view of Mt. Okuhodaka from Kappabashi bridge is breathtaking and the symbol of Kamikochi. ...is one of the main feature of Kamikochi. It was created by the eruption of Mt. Yake in 1915. The ash and rocks from the mountain stoped Azusa River and created this pond. It is very quite pond that mirrors the mountains of Kamikochi. ...is another beautiful pond of Kamikochi. It was also created by the eruption of Mt. Yakidake in 1915. The water is very pure and it is surrounded by beautiful marsh. ... is the sacred pond of Kamikochi. There is the upper shrine shrine of Hodaka Shrine. There are two ponds that has views of natural Japanese gardens. Mt. Myojin is located right next to the ponds. It has a very strong view of mountain and quiet ponds. It is highly respected by the poeple of Matsumoto. ... is the camp site surrounded by forest and pure water.